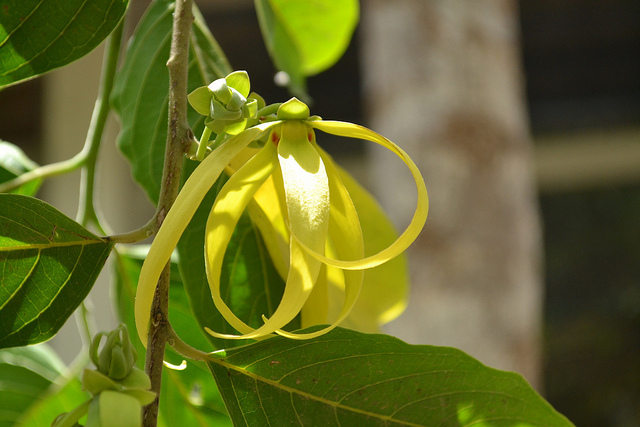 Ylang Ylang has an unusual but beautiful name – it means “Flower of Flowers” in the Philippines where it is native. The essential oil, extracted from the plant’s voluptuous blooms, is described as heady and sweet. Another unusual fact is that it is distilled in phases with the essence removed at different stages. The first distillation draw is called “Extra” and is the most densely floral, while the final product is called “Complete” and includes fractions of each stage to make a more combined floral and fruity scent. With its strong floral signature, it’s easy to understand why ylang ylang (Cananga odorata) is widely used in perfumery for oriental, woodsy, or floral themed perfumes. The exotic fragrance it adds to a blend also carries aphrodisiac qualities, which may add another intriguing layer to perfumes that it is in. It is rumored to reduce inhibitions, promoting confidence and sensuality, thus evoking the ancient use of perfume for desires of the heart. There are other, less sensationalized uses for ylang ylang. It alleviates anger, anxiety and stress by being relaxing and mildly sedating. A study of the oil examined these effects. The researchers concluded that, “ylang ylang oil caused a significant decrease of blood pressure. … Subjects in the ylang ylang oil group rated themselves more calm and more relaxed” making the researchers believe there is “evidence for the usage of the ylang ylang oil in aromatherapy such as causing a relief of depression and stress.” Perhaps ylang ylang perfume is perfect to wear when you need a calm sense of confidence. The strongly fragranced essential oil can get overwhelming for some, especially children. Ylang ylang is best used in small quantities and for short periods of time. It mixes well with citrus essential oils that help lighten ylang’s flowery scent and ensure it is attractive to both women and men who can benefit from its stress-relieving properties.